Tubekote internal coatings, under license from Tuboscope™ (licensed for South America excluding Brazil), are applied in either liquid or powder form inside steel pipes and tubulars used for the production and transportation of oil, gas, water and other corrosive industrial ﬂuids. The coatings are especially useful in protecting tubulars and oil ﬁeld drilling tools (drill pipes, sucker rods, packers, pumps, tubing, casing, etc.) where problems such as corrosion, abrasion, and scale or paraffin deposition may occur. These coatings can also be used in special Thru Kote ™ connection sleeves for protecting the welded joints of internally coated pipes. Tubekote’s smooth surface properties provide the added beneﬁt of improving the ﬂow of process ﬂuids. Specific coating can be selected based on operating temperature, pressure and process fluid and gases. Coatings are available for a variety of services such as; high temperatures and pressure, flow enhancement and abrasion and wear service. 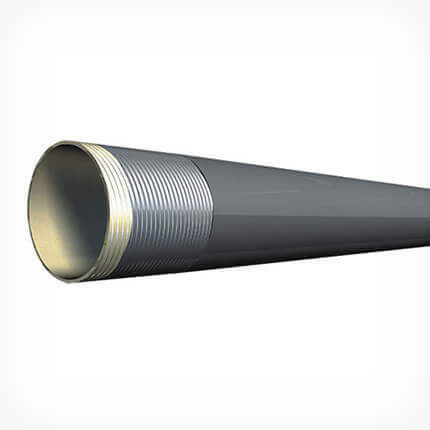 Available fully compatible internal anti-corrosion coated sleeve for protecting welded connections of coated pipes.